Mr. Xun WANG is now working as a research fellow at China Center for Contemporary World Studies (CCCWS). Prior to his service at CCCWS, he served as a Post doctoral research fellow of the Stockholm China Economic Research Institute at Stockholm School of Economics from September 1, 2011 to July 2013. Mr. Xun WANG’s current research focuses on macroeconomic policy, Chinese economy and international finance issues. He has published a number of journal articles about financial liberalization and development, including ‘Does Financial Repression Inhibit or Facilitate Economic Growth? A Case Study of China’s Reform Experience’ (Oxford Bulletin of Economics & Statistics), Financial Sector Policies and Inequality (China Economic Review), Financial Liberalizations and the Middle-income Trap: What can China Learn from the Cross-country Experience? (China Economic Review). Mr. Xun WANG received a Ph.D in Economics from National School of Development, Peking University, an M.A in Economics from the Sun Yat-set University and a B.A in International Economics from Hebei University of Economics & Trade. We also take this chance to remind you about the Second Science Slam, organized by Euraxess China with the support of ThinkIN China, and dedicated to young scholars and researchers. 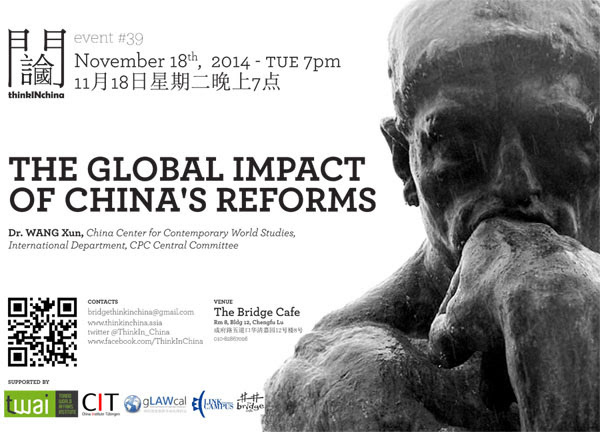 The event will be held tomorrow, Thursday November 6th at STEPS Bar in Wudaokou, starting from 18.30. See flyer attached for further information and don’t miss this great chance to meet fellow researchers and learn about their projects!